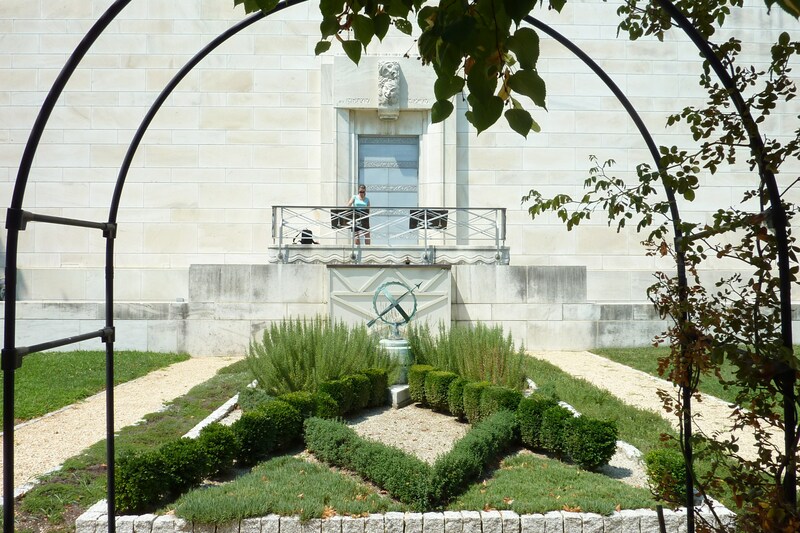 Exhibition Halls and Historic Documents? Kids Love ‘Em! I was planning on getting to the Folger Shakespeare Library’s “London: 1500-1700” exhibit sometime in September, once school had started back up and I was on one of my solo trips into the District. Alas, my kids (ages 10 and 9) wanted to do a D.C. day before school started back up and I figured I’d work in a stop at the Folger since we were starting out on Capitol Hill. We grab a quick lunch at We, the Pizza because I cannot be on Capitol Hill without a stop there. Then we head a few blocks north and sit in the Folger’s Elizabethan gardens to finish up our handmade coconut sodas and enjoy the shade, because it’s about 95 bloomin’ degrees and the sun’s brutal. Welcome to August in D.C., people. 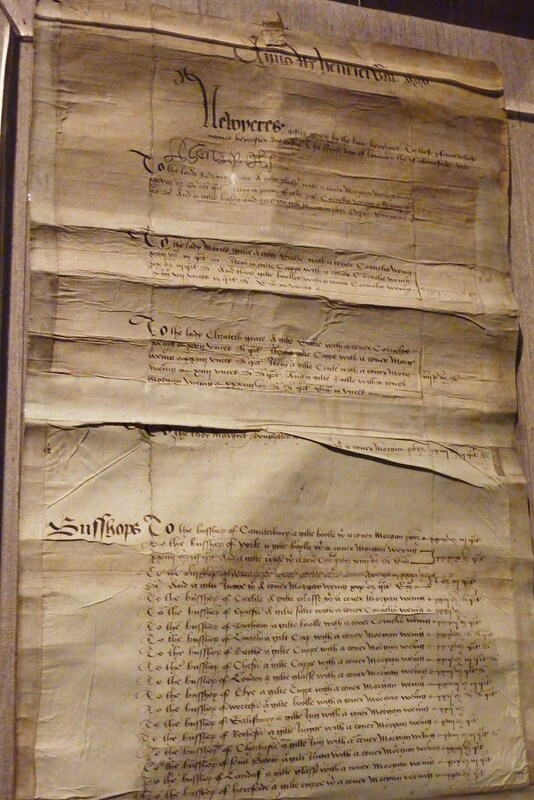 This is the lease for 3 tenements and a wharf from St. Margaret’s Parish to Thomas Glover, a waterman, for a period of 50 years as long as he didn’t use it for brothel houses or that sort of unsavoury thing. I’m quite excited to see this in person as I’ve seen it so many times in print of some sort. The book is, of course, a history of the Reformation from the Protestant viewpoint, if you can’t tell by the king’s planting his slippers all over the pope’s back. 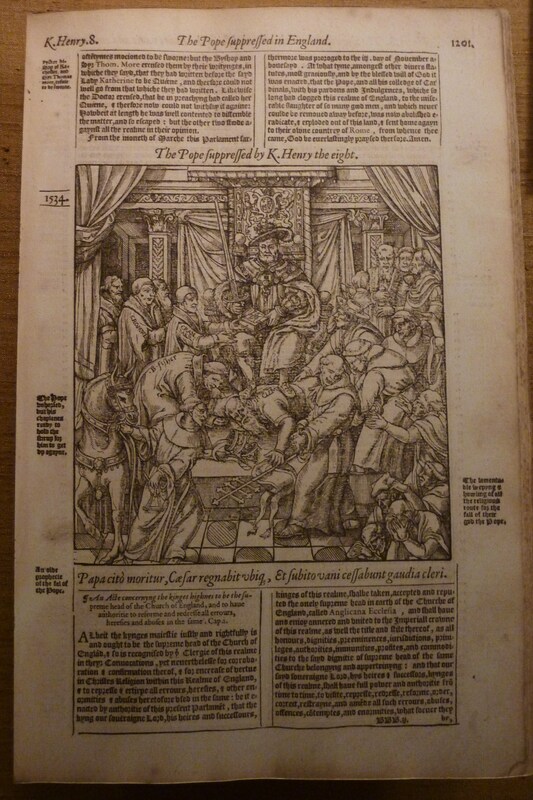 Anne Askew’s own recounting of her first interrogation was published in 1546 as the book you see below. Not to get too far off-track here, but I often ponder the popular view of Anne’s martyrdom versus the fate of Catherine of Aragon. Of course we can’t compare the outcomes of the two women’s lives. But more often than not, Anne is put on a pedestal for being “so brave and strong” whilst sticking to her faith, and Catherine is mocked for “being stubborn” in holding onto hers. I don’t take sides and I know there are exceptions, but this is what I hear and see primarily. But that’s a post for another day. Yep, stacking dolls of Henry and the Magnificent Six! 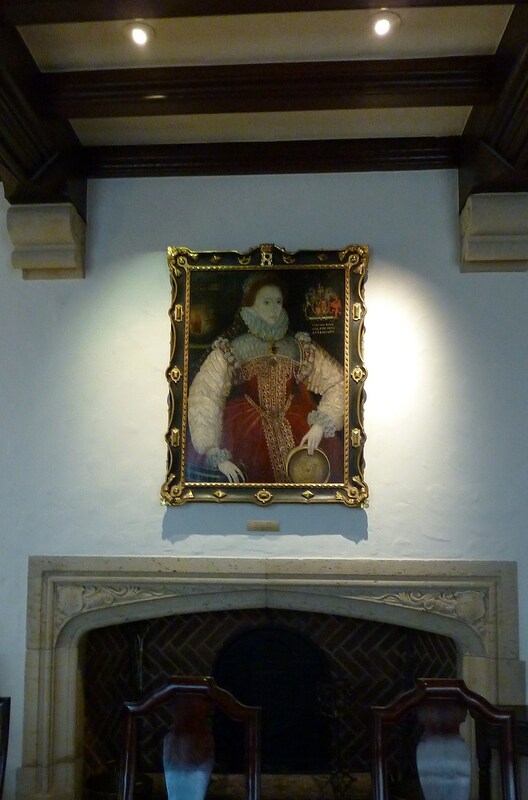 This is the Plimpton “Sieve” portrait, by George Gower, dating from 1579. (As I’m quite limited by my point-and-shoot and the lighting in the room, you will probably want to click here for a zoomable digital image of the painting.) In the queen’s left hand is, yep, a sieve. It’s a reference to the Roman vestal virgin Tuccia who advertised her v-card by being able to carry water in a sieve. I’ll bet Tim Tebow never thought of that approach. Her coat of arms sits above her left shoulder and the globe sits above her right shoulder, with “I see everything and much is lacking” in Italian below it. I am loving her crown, though not so much the black and gold striped scarf hanging from it. In typical Gloriana fashion, the dress is bejeweled to the hilt and looks like it weighs about 100 pounds. All in all, a stately portrait for a lady who always had a statement to make! There are many other items in the exhibit, of course. I’ve shared with you some of the Tudor-era treasures but there are others from that period, as well as lots from the post-Tudor years until 1700. But I don’t want to give away the farm because I’m hoping you’ll be able to see the exhibit for yourself; it runs through 30 September. * Special thanks to security guard (and crime fiction writer) Quintin Peterson for escorting us to the Founders’ Room to view the queen’s portrait, graciously answering all our questions, and giving us additional background on the Folger itself. 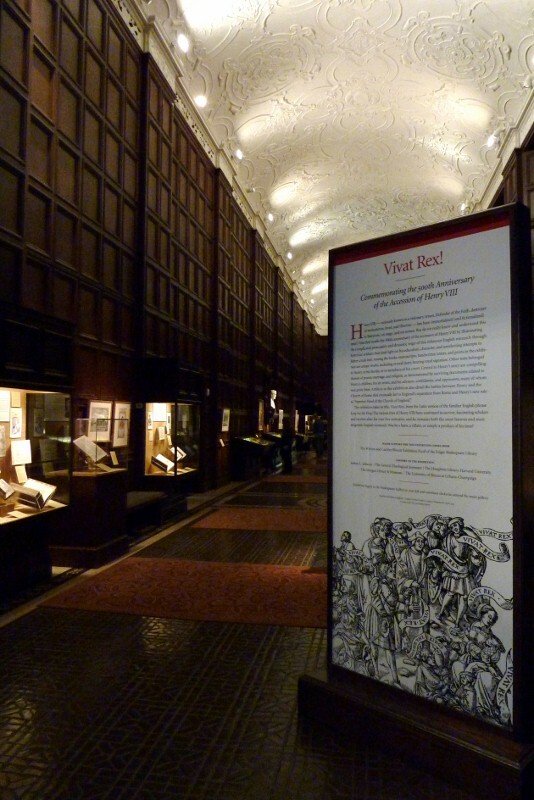 ** Have you come along with me to the Folger’s “Vivat Rex” exhibit? You can do so here. *** Why not take an 8-minute trip through Tudor D.C. with me on YouTube? I didn’t want to get started on reviewing books; I first dipped my toe into that water when I ranted about Georgiana, Duchess of Devonshire and her spoiled crew. I still plan on leaving book reviews to others, but there is a relatively new book I believe you should add to your queue, Tudor fans! This isn’t as much a review (I don’t feel I’m qualified as a book reviewer) as it is a recommendation for the book I read just after that one, which I have recently finished, and that is 1536: The Year That Changed Henry VIII by Suzannah Lipscomb. 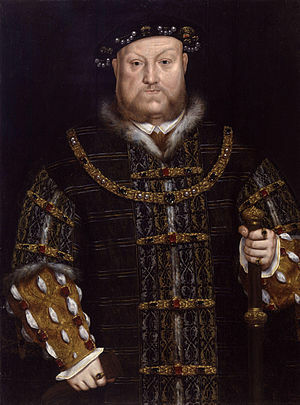 One of the tragedies of Henry VIII’s character is his change from charming, athletic prince to paranoid, gross, and cruel king. Dr. Lipscomb explores the events of 1536 and puts forth why that year was a crucial turning point in the change we see. She easily conveys her vast knowledge of the subject in a well-organized and conversational manner, making 1536 a pleasure to read. It is only 209 pages, perfect for getting your Tudor fix during a long day at the beach or during a quiet weekend! The aim of the program seems to be, as Jerry Seinfeld might muse, “Henry VIII…What’s the deal with him? ?” Our hosts are on a mission to find out, combining history, science, and medicine. They are Dr. Lucy Worsley, historian with adorable bobbed haircut and barrette, Robert Hutchinson, Henry VIII biographer, and Dr. Catherine Hood, medical doctor. Family History — Henry was the third child of Henry VII and Elizabeth of York. As a little boy, he was well-built and healthy. Soon his father contracted tuberculosis, which we have treatment for these days but then it meant you were probably a goner. Dad may have passed it to his heir, Prince Arthur, who died soon after. Next up, Henry! At the age of 17, he had the crown but no TB. Whew! Infections — Henry was a strong teen king, athletic and all that. But London was a filthy, rat-infested mess at that point. Five years into his reign he comes down with a fever, which was probably smallpox. Dr. Hood talks about the pustules and shows us gruesome pictures. To review: vaccines are good, mmmkay? At nearly 30, he gets another fever. This was probably malaria, which was going around due to all the marshes in the area to host all those mosquitoes. Henry suffered repeated bouts of the disease and it’s thought to have contributed to his paranoia, which turned to flat-out hypochondria. Luckily for him, he wasn’t able to Google the heck out of his symptoms at the time which surely would have made things 10 times worse. Sporting Injuries — We see Henry’s armor, which gives us a good idea of his size, and the obnoxious codpiece, which gives us a good idea of his, well, moving on. Henry was 6’1″, a virtual giant for Tudor times. His calves were divine, which was part of his appeal. Whereas today, Men’s Health magazine seems to run the same “great abs” cover story every month, at that time they would be most interested in lovely legs on a man. Right, so on to the head injury he got in a moment of temporary stupidity/distraction as he forgot to lower his mask in a game that involves a long, pointy lance. Henry was lucky to have only sustained minor injury, as he could have lost his eye or worse. His migraines can be traced back to this particular event. This sporty guy also enjoyed squash and tennis, which led to another injury in 1527, a wrenched foot. For some time afterward he had to baby his foot by wearing soft slippers; his faithful courtiers followed suit in sympathy. Awww. At age 36 he developed a varicose ulcer, brought on by those fashionable but constrictive garters. Today this kind of thing heals very slowly, so it’s a wonder he didn’t die of blood poisoning at the time. As it were, his docs still went by the whole four-humours thing, examining stools, tasting urine, employing the most recent advances in medical science. Bring on medical historian Steve Bacon, dressed as a Tudor physician and bearing glistening black leeches. He places them on some victims/volunteers, and they claim it feels like a pinprick. Apparently leeches leave an anticoagulant under your skin when they are removed, so you keep bleeding. I learn something new every day! Back to Injuries — January 1536, another jousting accident, but this is The Big One. The armoured king is racing with his armoured horse at top speed, and the latter lands atop the former. That’s gotta hurt. In fact, Henry is unconscious for two hours. To drive home the point of how disastrous this was, the Royal Marines Trauma Surgeon recreates the event by dropping a 1500 pound weight from a crane onto a big fat pig from 14 feet above. I have to wonder where PETA is. Although the pig is already dead, the organization can usually find something to crow about in similar situations. The surgeon deduces that the king survived only because of his armor, and even then I am gobsmacked that he survived at all. Certainly, though, his brain rattled around sufficiently in his skull. If his frontal lobe were affected, the team mentions, his personality was most definitely affected by this. His leg ulcers stopped draining which made him black in the face, so his docs would cauterise the wounds with hot irons so they could drain. The monarch who once displayed stunning legs now had gams covered in runny sores which could be smelled from three rooms away. Gah! Costumed Steve Bacon returns to show us the scary medieval amputation devices of the day. Only 10 percent of amputees survived back then, so no one wanted to take the chance with Henry. He therefore got to keep his nasty, stinking leg. Diet — Between his 20s and his 50s, the tall king went from a 32″ waistline to a 52″ one, from a 39″ chest to a 53″ one. He was now nearly 400 pounds! So Dr. Worsley takes us for a trip around the supermarket for “Henry’s weekly shop.” This is fantastic. She piles beef, lamb, chicken, pork, and rabbit into a cart while we learn he also ate peacock and swan. Tesco may have been out of those. She heaves 70 pints of ale and lots of wine in as well, and tops it off with what looks like 24 bags of white bread. By-passing the produce section, she states this was food for peasants so the [constipated] monarch ate none of it, although he did fancy strawberries. In the virtual autopsy, we see just what kind of a number this diet did on Henry’s insides. There’s a thick subcutaneous layer of fat, of course, and a fatty liver. His enlarged heart pumps furiously in his chest, and he’s clinically obese — at high risk for high blood pressure and type-2 (late-onset) diabetes. In fact, diabetes seems to be a definite to this crew, and I have to agree. The program airs again on Tuesday, the first of February at 6:00 pm ET. Check this link for more updated info. * In one of the “Break with Rome” cases, there is a prayer book (below; click for a larger image) that belonged to a Reformer. 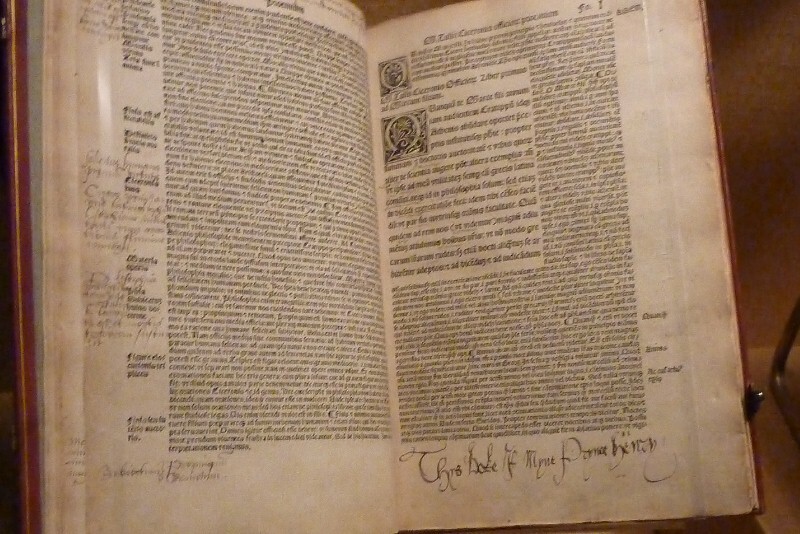 You can see that certain passages have been crossed out, and the word “pope” is scratched out (left page, sixth line down). 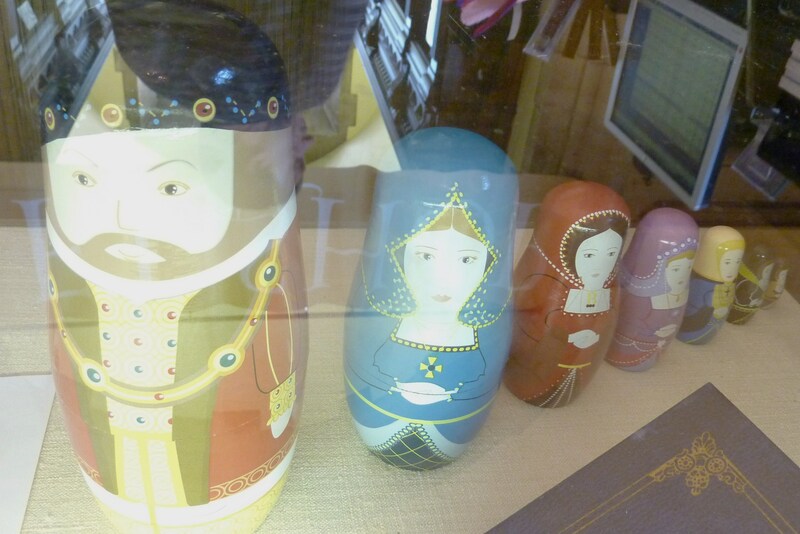 The gift shop at the rear of the exhibit hall is a treasure trove of Tudor-era goodies. 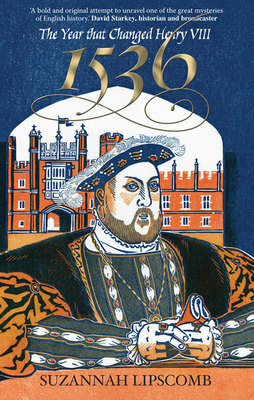 Lots are geared toward Henry VIII specifically and range from the serious (such as David Starkey books, books on the Reformation, and informative DVDs) to the flat-out-fun (such as the “disappearing wives” mug, a House of Tudor board game, and a set of plush Christmas ornaments featuring the monarch and all his lovely maidens). It being the Folger Shakespeare Library, there are also lots of neat Shakespearean-themed gifts, including Elizabeth I items. The docents’ desk at the entrance has great activity flyers for kids, such as a Tudor family tree with space for children to fill out their own tree. Hopefully they will not need to include family members who have been beheaded! **Special thanks to docents Jennifer Newton and Michael Neuman for their time, assistance, and knowledge. I spent yesterday morning at our local mall, strolling beneath the tinsel and red baubles to the sounds of Frank Sinatra’s Christmas album. It’s only the first week of November! But I adore Christmas so I can’t complain, and I got a tiny bit of shopping done as well. Because of the wrinkle, it is difficult to see “to the Lady Margret Doughtles” after that, followed by the list of bishops. I’m able to make out “Canterbury,” “York,” “Lincoln,” and “London.” Maybe you can figure out more? 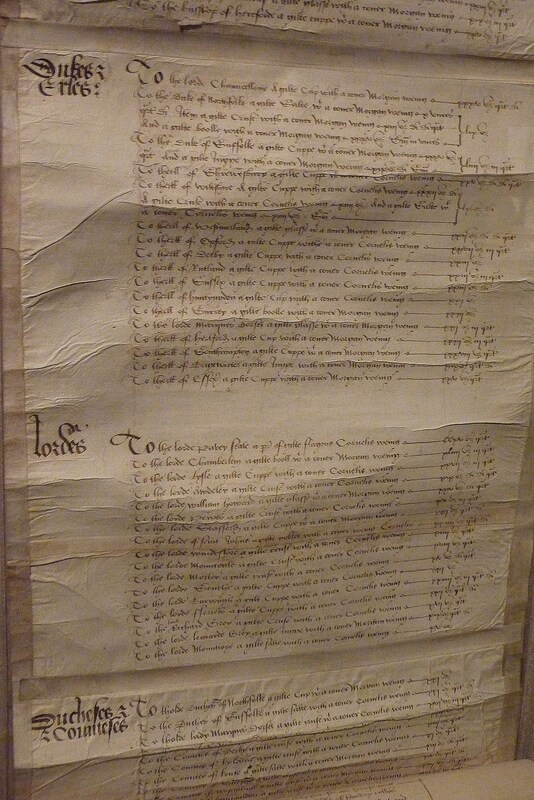 The second pic (below) is the lower half of the scroll, and lists the goods for dukes and lords, earls, and duchess and countesses. 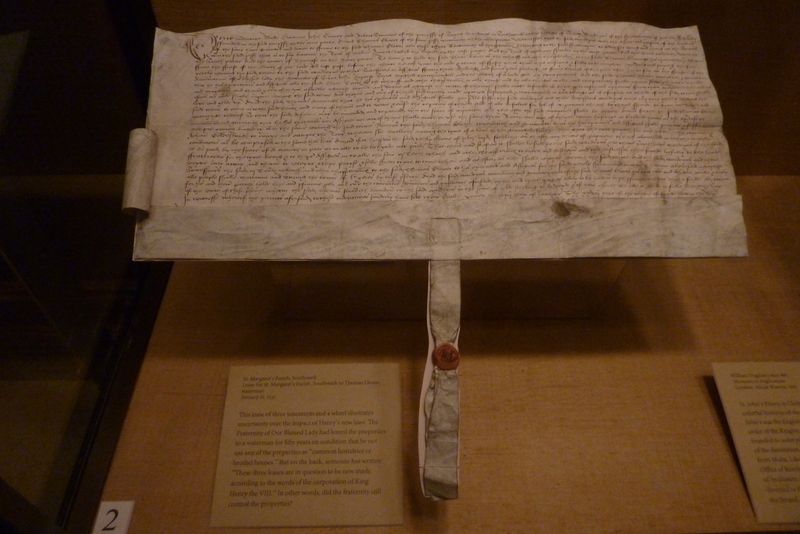 Near this scroll is a bittersweet spot in history, the account of another New Year’s Day, that of 1511. In Holinshed’s Chronicles, we see the whole shebang celebrating the birth of Henry and Cat of Aragon’s son, Prince Henry (who died nearly two months later). 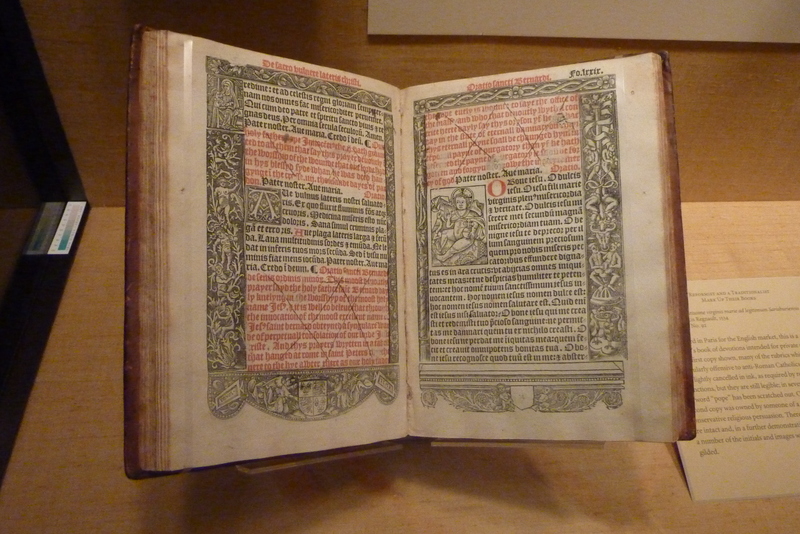 The next post will wrap up the peek at this fine exhibit, including some chat about Catherine of Aragon’s letter to her nephew, and a Reformist vs. a Traditionist face-off in the pages of a Tudor-era prayer book. Finally, I made it to the Vivat Rex! 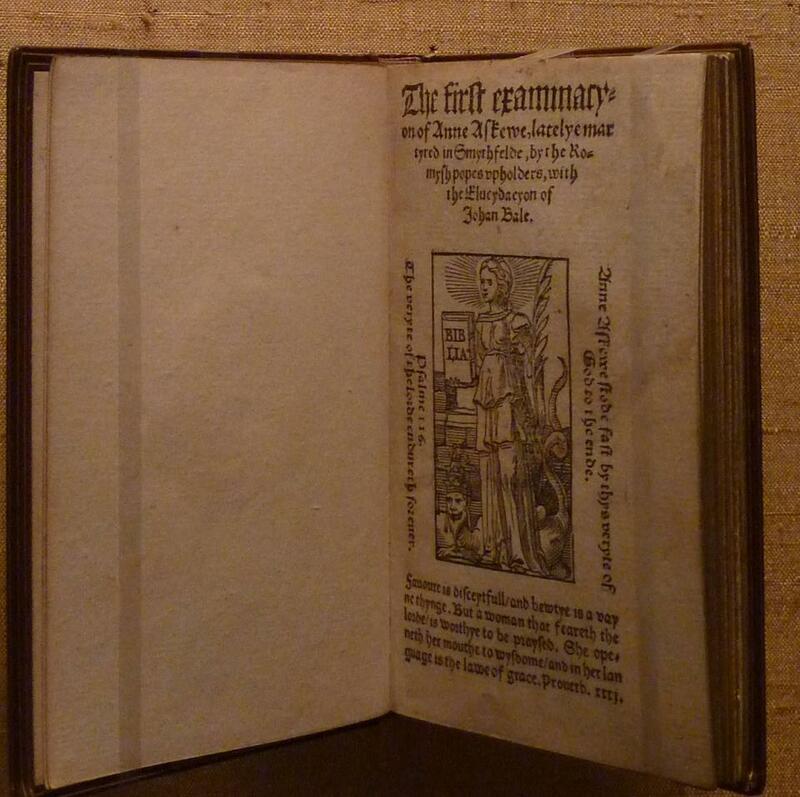 exhibit at the Folger Shakespeare Library in Washington D.C. last week, and it did not disappoint! Most of the exhibit is in a gorgeous hallway panelled in dark wood with an ivory embossed ceiling, the perfect setting for these grand and historically-rich books and manuscripts. The first case is, to me, one of the most interesting in the exhibit. It has just enough items linking the power-hungry man we know to his humble (?) beginnings. Elizabeth of York’s little prayer book has her loopy-scratchy writing inside: “Madam j pray yow Remember me in yowr good prayers yawr mastras Elyzabeth R.” (Now there’s a kreetiv spelling of that name I’d never seen before! Remember that even names weren’t spelled in a standardized way at the time.) There is a beautifully illustrated page from Hall’s Chronicle showing how Henry VIII eventually became the personification of Chez York plus Chez Lancaster. There are several cases devoted to Henry as “Defender of the Faith” including (wait for it) the actual bull signed by Pope Leo X declaring Henry so. It is small but impressive, considering the weight it held and what was to follow. Then Leo said something like “But that’s not all! There’s more!” and presented the king with the real treasure in the same case, the Golden Gospels of Henry VIII. This serious tome has satiny cranberry-coloured vellum pages stained with berries and gracefully decked out in neat gold Latin printing. Rumor has it this impressive book was made for the coronation of the Holy Roman Emperor Otto III in 983. No way was Henry regifting this! 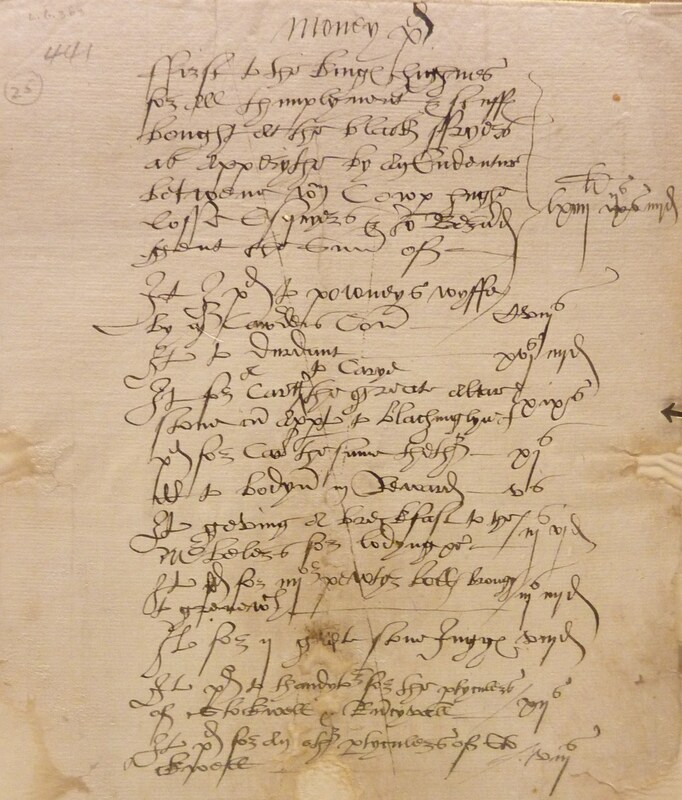 Want to see pics of Henry VIII’s looooong holiday shopping list from the 1538-39 season? You’ve got to wait for the next blog post, coming tomorrow!